A Hong Kong housewife has been found guilty of imprisoning and abusing a young Indonesian maid whose case has prompted protests and calls for reform of the city's laws governing domestic workers. Over several months last year, Erwiana Sulistyaningsih was kept as a prisoner in the home of Law Want-tung, a 44-year-old mother of two who regularly deprived her of food, sleep and payment for long hours of grueling work. After the verdict, Erwiana thanked her supporters and called for the governments of Hong Kong and Indonesia to do more to protect the rights of migrant workers. "What I hope together with my fellow domestic workers are just fair and humane treatment and for people to stop treating us like slaves," she said. Law was convicted of grievous bodily harm, common assault, and failing to pay Erwiana's wages or give her statutory rest days. Sentencing has been deferred until February 27 to give the defense time to compile character references and psychological reports. In delivering her verdict, Judge Amanda Woodcock described the 23-year-old victim as "a simple young lady who tried to financially better her life and that of her family." She said Erwiana had no reason to fabricate the evidence, and that the abuse had been so frequent and over such a long period of time, it was reasonable that the young maid might not be able to recall specific dates. Woodcock said Erwiana thought she was under surveillance at all times, and believed Law's threats that her family would be killed if she told anyone about the abuse. "They made her compliant and more subservient," Woodcock said. Erwiana started work in Law's home in May 2013. However, within one month she tried to escape because she hadn't been paid her wages. The court heard she called the building's security guard who contacted her agency. Later, an Indonesian woman turned up and took her back to the flat, saying there was no need to find a new employer. That's when the physical abuse started. It began with punches, then progressed to beatings with a mop handle, coat hangers, and the rod from a vacuum cleaner. By the following January, she had become too weak to work and was escorted to the airport with a one-way ticket by her employer, who told her to wear a diaper because she was too ill to stand. "(Law) asked me to put on six layers of clothes and two pairs of pants," Erwiana told the court. "  She also asked me to wear Pampers because I was unable to go to the toilet because I was very weak. She put make up on me so I don't look like someone who'd just been tortured." She also repeated threats to kill her parents if she told anyone of the abuse, Erwiana said. 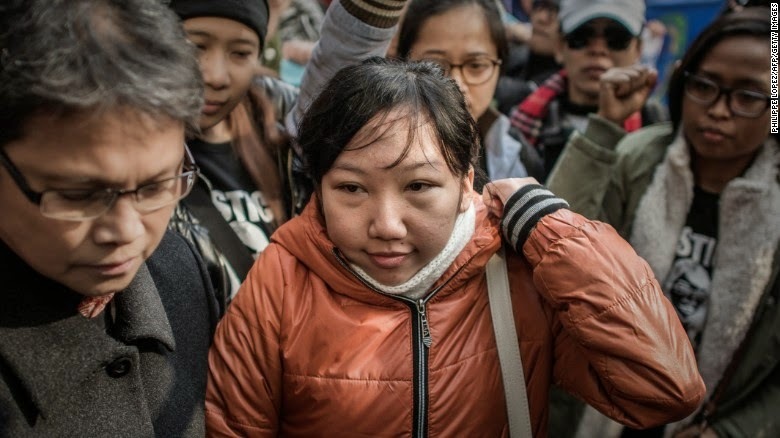 Even before the trial, Erwiana's case became a cause celebre for campaigners who say that Hong Kong rules dictating that domestic workers reside at their employers' homes expose hundreds of thousands of foreign workers -- mostly women -- to potential abuse. Last April, Erwiana was named by Time magazine as one of the world's 100 most influential people, which commended her bravery for drawing attention to "the plight of a vulnerable often invisible population." The Hong Kong government started allowing foreign domestic helpers to work in the Chinese territory in the 1970s to fill a shortage of local staff. Now, around 320,000 come here from Indonesia and the Philippines, as well as other Asian countries, to earn more money than they could at home. Many who come via agencies direct from their home countries don't meet their employer before signing a two-year contract requiring them to live and work in their homes. They're paid a minimum wage of HK$4,110 ($530) a month and by law are only entitled to one day off a week. After the verdict, Amnesty International said the case should serve as a "wake-up call" for the government to stop the "widespread exploitation" of domestic workers. "The Hong Kong authorities can no longer bury their heads in the sand and dismiss horrific abuses as isolated incidents," said Norma Kang Muico, Amnesty's Asia-Pacific migrant rights researcher. Amnesty says workers are under pressure to stay in abusive situations because Hong Kong law demands they leave the city within two weeks of terminating their contract, if they can't find a new job. During the trial, Erwiana told the court the only time she was allowed to rest was between 1 p.m. and 6 p.m. She was made to clean doors at 3 a.m., she said, so the neighbors didn't see her. Desperately hungry, on one occasion she said she knocked on a neighbor's door and asked for food. He immediately shut it. Erwiana said Law's children overheard and told their mother who then threatened her again. Erwiana slept on the floor, moving the vacuum cleaner and bags of books to make room to lie down when permitted. By day, she was so tired that on at least one occasion she fell asleep while doing the vacuuming. Her employer, Law, grabbed the vacuum, she said, and shoved it in her mouth, twisting it so the metal tube cut her lips and her "mouth was bleeding." Another time when she fell asleep while vacuuming, Erwiana said Law stripped her in the bathroom and sprayed her with cold water. When the water was turned off, she was forced to stand naked in front of a fan. After one to two hours, she was allowed to dress and resume work, the court heard. Law and Erwiana were not the only ones living in the flat during the abuse. Law's two children -- her 18-year-old son Edmund Tsui Wing-kit and 16-year-old daughter referred to only as"Kelly" to protect her identity -- provided no evidence against their mother. Tsui testified that she was "gentle" to maids. His sister said she didn't pay much attention. Erwiana said Law's husband was never there and she had only seen old wedding photos of him in the flat. During questioning by the defense, Erwiana became upset when it was suggested she was making up the threats. Why didn't she call for help? Erwiana said it was because she wasn't let out, her passport had been taken, and she feared that Law would make good on her threats to kill her family. She tried to escape twice; both attempts failed. Her employer watched her every move, she said, even on CCTV via her mobile phone when she wasn't there. Two other domestic workers were involved in the case, who alleged they too were the victims of assault and criminal intimidation while working in Law's home. Judge Woodcock found Law guilty of assaulting and threatening Tutik Lestari Ningsih sometime between April 2010 and March 2011. However, she found Law not guilty of the same offenses against another domestic worker, Nurhasanah, dating back to late 2011. When Erwiana's employer escorted her to the airport in early January 2014, other Indonesian women noticed her condition and pressed her to tell them what had happened. One of them, Riyanti, told CNN Erwiana tried to blame her scarred and blackened skin on allergies, before admitting, "I was tortured." Erwiana's claims led to protests in Hong Kong, demands for justice and calls for the law to be changed to allow domestic foreign workers to live outside their employers' home. After the verdict, Erwiana said she wouldn't be returning to Hong Kong and to her former life as a maid. "My body is not as strong anymore. Being a domestic helper is heavy work that needs strength and energy," she said. She said she's been offered a scholarship to a private university and plans to finish school, with the aim of helping other victims of abuse. "I have a dream of putting up a foundation that will help other migrant workers," she said. CNN's Kathy Quiano contributed to this report.